General: If a reaction suggesting sensitivity or chemical irritation occurs, use of the medication should be discontinued. Exposure to sunlight, including sunlamps, should be minimized during the use of RETIN-A, and patients with sunburn should be advised not to use the product until fully recovered because of heightened susceptibility to sunlight as a result of the use of tretinoin. Patients who may be required to have considerable sun exposure due to occupation and those with inherent sensitivity to the sun should exercise particular caution. Use of sunscreen products and protective clothing over treated areas is recommended when exposure cannot be avoided. Weather extremes, such as wind or cold, also may be irritating to patients under treatment with tretinoin. RETIN-A (tretinoin) acne treatment should be kept away from the eyes, the mouth, angles of the nose, and mucous membranes. Topical use may induce severe local erythema and peeling at the site of application. If the degree of local irritation warrants, patients should be directed to use the medication less frequently, discontinue use temporarily, or discontinue use altogether. Tretinoin has been reported to cause severe irritation on eczematous skin and should be used with utmost caution in patients with this condition. Drug Interactions: Concomitant topical medication, medicated or abrasive soaps and cleansers, soaps and cosmetics that have a strong drying effect, and products with high concentrations of alcohol, astringents, spices or lime should be used with caution because of possible interaction with tretinoin. Particular caution should be exercised in using preparations containing sulfur, resorcinol, or salicylic acid with RETIN-A. It also is advisable to â€œrestâ€ a patient's skin until the effects of such preparations subside before use of RETIN-A is begun. Carcinogenesis: Long-term animal studies to determine the carcinogenic potential of tretinoin have not been performed. Studies in hairless albino mice suggest that tretinoin may accelerate the tumorigenic potential of weakly carcinogenic light from a solar simulator. In other studies, when lightly pigmented hairless mice treated with tretinoin were exposed to carcinogenic doses of UVB light, the incidence and rate of development of skin tumors was reduced. Due to significantly different experimental conditions, no strict comparison of these disparate data is possible. Although the significance of these studies to man is not clear, patients should avoid or minimize exposure to sun. Pregnancy: Teratogenic effects. Pregnancy Category C. Oral tretinoin has been shown to be teratogenic in rats when given in doses 1000 times the topical human dose. 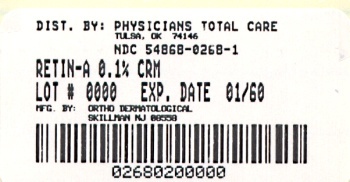 Oral tretinoin has been shown to be fetotoxic in rats when given in doses 500 times the topical human dose. 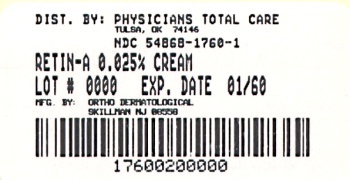 Topical tretinoin has not been shown to be teratogenic in rats and rabbits when given in doses of 100 and 320 times the topical human dose, respectively (assuming a 50 kg adult applies 250 mg of 0.1% cream topically). However, at these topical doses, delayed ossification of a number of bones occurred in both species. These changes may be considered variants of normal development and are usually corrected after weaning. There are no adequate and well-controlled studies in pregnant women. Tretinoin should be used during pregnancy only if the potential benefit justifies the potential risk to the fetus. Nursing Mothers: It is not known whether this drug is excreted in human milk. Because many drugs are excreted in human milk, caution should be exercised when RETIN-A is administered to a nursing woman. The skin of certain sensitive individuals may become excessively red, edematous, blistered, or crusted. If these effects occur, the medication should either be discontinued until the integrity of the skin is restored, or the medication should be adjusted to a level the patient can tolerate. True contact allergy to topical tretinoin is rarely encountered. Temporary hyper or hypopigmentation has been reported with repeated application of RETIN-A. Some individuals have been reported to have heightened susceptibility to sunlight while under treatment with RETIN-A. To date, all adverse effects of RETIN-A have been reversible upon discontinuance of therapy (see Dosage and Administration Section). RETIN-A Gel, Cream or Liquid should be applied once a day, before retiring, to the skin where acne lesions appear, using enough to cover the entire affected area lightly. Liquid: The liquid may be applied using a fingertip, gauze pad, or cotton swab. If gauze or cotton is employed, care should be taken not to oversaturate it to the extent that the liquid would run into areas where treatment is not intended. 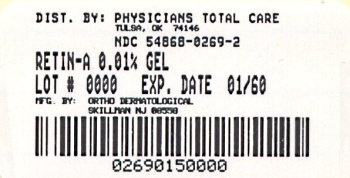 Gel: Excessive application results in â€œpillingâ€ of the gel, which minimizes the likelihood of over application by the patient. Storage Conditions: RETIN-A Liquid, 0.05%, and RETIN-A Gel, 0.025% and 0.01%: store below 86°F. RETIN-A Cream, 0.1%, 0.05%, and 0.025%: store below 80°F. 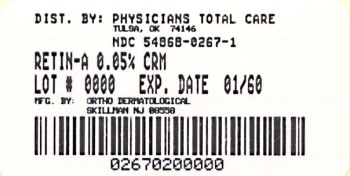 THIS LEAFLET TELLS YOU ABOUT RETIN-A (TRETINOIN) ACNE TREATMENT AS PRESCRIBED BY YOUR PHYSICIAN. THIS PRODUCT IS TO BE USED ONLY ACCORDING TO YOUR DOCTOR'S INSTRUCTIONS, AND IT SHOULD NOT BE APPLIED TO OTHER AREAS OF THE BODY OR TO OTHER GROWTHS OR LESIONS. THE LONG-TERM SAFETY AND EFFECTIVENESS OF THIS PRODUCT IN OTHER DISORDERS HAVE NOT BEEN EVALUATED. IF YOU HAVE ANY QUESTIONS, BE SURE TO ASK YOUR DOCTOR. The effects of the sun on your skin. As you know, overexposure to natural sunlight or the artificial sunlight of a sunlamp can cause sunburn. Overexposure to the sun over many years may cause premature aging of the skin and even skin cancer. The chance of these effects occurring will vary depending on skin type, the climate and the care taken to avoid overexposure to the sun. Therapy with RETIN-A may make your skin more susceptible to sunburn and other adverse effects of the sun, so unprotected exposure to natural or artificial sunlight should be minimized. Laboratory findings.When laboratory mice are exposed to artificial sunlight, they often develop skin tumors. These sunlight-induced tumors may appear more quickly and in greater number if the mouse is also topically treated with the active ingredient in RETIN-A, tretinoin. In some studies, under different conditions, however, when mice treated with tretinoin were exposed to artificial sunlight, the incidence and rate of development of skin tumors was reduced. There is no evidence to date that tretinoin alone will cause the development of skin tumors in either laboratory animals or humans. However, investigations in this area are continuing. Use caution in the sun. When outside, even on hazy days, areas treated with RETIN-A should be protected. An effective sunscreen should be used any time you are outside (consult your physician for a recommendation of an SPF level which will provide you with the necessary high level of protection). For extended sun exposure, protective clothing, like a hat, should be worn. Do not use artificial sunlamps while you are using RETIN-A. If you do become sunburned, stop your therapy with RETIN-A until your skin has recovered. Avoid excessive exposure to wind or cold. Extremes of climate tend to dry or burn normal skin. Skin treated with RETIN-A may be more vulnerable to these extremes. Your physician can recommend ways to manage your acne treatment under such conditions. Possible problems. The skin of certain sensitive individuals may become excessively red, swollen, blistered or crusted. If you are experiencing severe or persistent irritation, discontinue the use of RETIN-A and consult your physician. There have been reports that, in some patients, areas treated with RETIN-A developed a temporary increase or decrease in the amount of skin pigment (color) present. The pigment in these areas returned to normal either when the skin was allowed to adjust to RETIN-A or therapy was discontinued. Do not use other medications with RETIN-A which are not recommended by your doctor. The medications you have used in the past might cause unnecessary redness or peeling. If you are pregnant, think you are pregnant or are nursing an infant: No studies have been conducted in humans to establish the safety of RETIN-A in pregnant women. If you are pregnant, think you are pregnant, or are nursing a baby, consult your physician before using this medication. Use a mild, non-medicated soap. Avoid frequent washings and harsh scrubbing. Acne isn't caused by dirt, so no matter how hard you scrub, you can't wash it away. Washing too frequently or scrubbing too roughly may at times actually make your acne worse. Wash your skin gently with a mild, bland soap. Two or three times a day should be sufficient. Pat skin dry with a towel. Let the face dry 20 to 30 minutes before applying RETIN-A. Remember, excessive irritation such as rubbing, too much washing, use of other medications not suggested by your physician, etc., may worsen your acne. To get the best results with RETIN-A therapy, it is necessary to use it properly. Forget about the instructions given for other products and the advice of friends. Just stick to the special plan your doctor has laid out for you and be patient. Remember, when RETIN-A is used properly, many users see improvement by 12 weeks. AGAIN, FOLLOW INSTRUCTIONS â€“ BE PATIENT â€“ DON'T START AND STOP THERAPY ON YOUR OWN â€“ IF YOU HAVE QUESTIONS, ASK YOUR DOCTOR. Apply RETIN-A once daily before bedtime, or as directed by your physician. Your physician may advise, especially if your skin is sensitive, that you start your therapy by applying RETIN-A every other night. First, wash with a mild soap and dry your skin gently.WAIT 20 to 30 MINUTES BEFORE APPLYING MEDICATION; it is important for skin to be completely dry in order to minimize possible irritation. It is better not to use more than the amount suggested by your physician or to apply more frequently than instructed.Too much may irritate the skin, waste medication and won't give faster or better results. Cream: Squeeze about a half inch or less of medication onto the fingertip. While that should be enough for your whole face, after you have some experience with the medication you may find you need slightly more or less to do the job. The medication should become invisible almost immediately. If it is still visible, you are using too much. Cover the affected area lightly with RETIN-A (tretinoin) Cream by first dabbing it on your forehead, chin and both cheeks, then spreading it over the entire affected area. Smooth gently into the skin. Gel: Squeeze about a half inch or less of medication onto the fingertip. While that should be enough for your whole face, after you have some experience with the medication you may find you need slightly more or less to do the job. The medication should become invisible almost immediately. If it is still visible, or if dry flaking occurs from the gel within a minute or so, you are using too much. Cover the affected area lightly with RETIN-A (tretinoin) Gel by first dabbing it on your forehead, chin and both cheeks, then spreading it over the entire affected area. Smooth gently into the skin. Liquid: RETIN-A (tretinoin) Liquid may be applied to the skin where acne lesions appear, spreading the medication over the entire affected area, using a fingertip, gauze pad, or cotton swab. If gauze or cotton is employed, care should be taken not to oversaturate it to the extent that the liquid would run into areas where treatment is not intended (such as corners of the mouth, eyes, and nose). RETIN-A works deep inside your skin and this takes time. You cannot make RETIN-A work any faster by applying more than one dose each day, but an excess amount of RETIN-A may irritate your skin. Be patient. If RETIN-A is going to have a beneficial effect for you, you should notice a continued improvement in your appearance after 6 to 12 weeks of therapy. Don't be discouraged if you see no immediate improvement. Don't stop treatment at the first signs of improvement. All questions of a medical nature should be taken up with your doctor. For more information about RETIN-A (tretinoin), call our toll-free number: 800-426-7762. Call between 9:00 a.m. and 3:00 p.m. Eastern Time, Monday through Friday.